Roam the Planet - Oh Happy Day! Before we left we went to a clinic and bought all sorts of vaccinations for our trip. One that we didn’t get was rabies. It cost about $1000 each and only delays the time before you need post-exposure treatment. In other words, you’d still have to get the shots after exposure, but you’d have a few more days until it’s required. Because of that and the price, we decided against it. Besides, I thought, I don’t even like dogs. I’ll steer clear. Obviously, what you have probably already guessed, is that I have since been bit by a dog. About a month ago in Quito, when we visited El Panecillo, we couldn’t find an empty cab to take us to our next destination, so we walked down the hill in search of one. We passed by a car parked in a driveway when a small dog jumped out from underneath it, barking and growling at us angrily. Dusty took a step back to get out of his way, but we both thought it was pretty cute and laughed at it. Seconds later his bigger brother snuck out from under the same car and took a bite out of my right ankle. Either one bite was enough for him or my scream scared him because he immediately ran back under the car. I wasn’t exactly sure how bad the damage was so I took a peak under the leg of my jeans and saw I was bleeding. Oh crap. We still didn’t have a taxi so Dusty took off down the road after a policeman that had driven by earlier. Finally a cab pulled up, I lifted my leg to show him the damage and said, “Perro!” He understood. I jumped in, we picked up Dusty and headed to the hospital. When the doctor came to me and said, “Que paso?” which means “What happened?”. I told him, “Un perro” and then showed him my leg and performed a mouth movement for bite because I hadn’t learned that yet. He said again, “Que paso?”. Again, I repeated what happened with the bite sign and all. Then they all, doctors and patients, started to giggle because he meant, “What happened, as in what’s your injury?”. I cried out of frustration. They all felt bad. :) Grrr, stupid Spanish! After that, I sat and waited for a while longer while the other injured continued to talk to me and show me what would be my rabies treatment by stabbing themselves in the stomach. My face probably gave away my shock because they started to say “Tranquilo! Tranquilo!”. One man even came over and tried to give me $5 to pay for the injection. I kindly refused but was really happy that he was so kind to offer. Finally, I was ushered into the room where they determined that my achilles was intact. I received 6 stitches and was given a prescription for antibiotics, pain meds and injections. 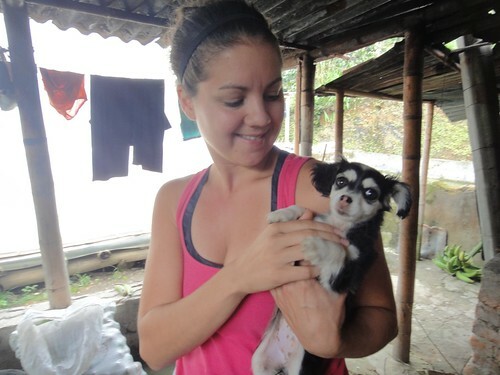 Next we were off to a clinic where I would receive 7 rabies shots in the stomach over 7 days. They don’t hurt by the way. What did hurt was being cut off from caffeine, alcohol and exercise! I asked my sister if she could fathom traveling and not being able to have caffeine or alcohol and she said “Um, yeah…it’s called pregnancy.” Right. We didn’t spend a dime on any medical care in Ecuador, it was all free. But, we did have a ton of taxi fares getting to and from the clinic. Quito is at a pretty high altitude so even walking was difficult to not break a sweat. After the first 7 injections, I would have to receive another one 10 days later, and then 20 days after that and 60 days after that. That’s no exercise until March! This was really putting a damper on our trip. No snorkeling in the Galapagos (which we were still considering at the time), no mountain biking down volcanoes and no hiking in the jungle. It was such a bummer. Ten days after my seventh shot I received my eighth in Cuenca, Ecuador. There they told me I could certainly exercise, 3 days after the shot. Caffeine was also permitted but still no alcohol. That was fine because at least coffee and chocolate were back in my life! We celebrated by surfing in Peru. Today, twenty days after my eighth shot, I received my ninth here in Lima, Peru. I received the awesome news that alcohol is now allowed! Doing without alcohol has been easy as it was easily replaced by ice cream! 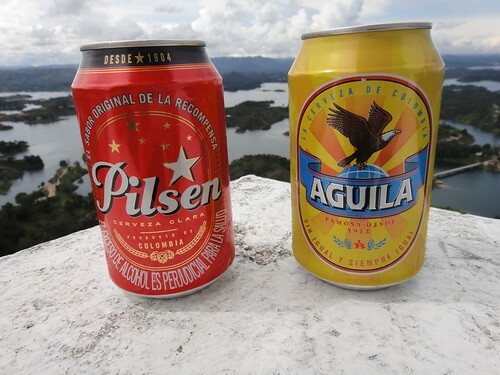 However, Dusty and I do enjoy trying the local beers of each country we visit. Also, I was not happy that in a month I’d be in Argentina, savoring some nice Argentine steak without the assistance of delicious Argentine wine. That would just not have been fair. Luckily, all is right in the world again. Party, party, party! I was given a prescription for a tetanus shot which I didn’t need because I received one before we left for South America. I didn’t say anything to the pharmacist, cause why would she care. Well, because they sell them there at the pharmacy. She gave me a little syringe full of tetanus which I was suppose to administer myself. I kindly declined. The rabies injections were not what I would have received in the States. According to the doctor at the private hospital and the folks at Anthem, rabies strains are different in different parts of the world, therefore requiring different treatment. Several people have asked if the dog “looked rabid” or sick. To us, it looked like it was simply defending it’s territory. It attacked and then went away when we got further from it’s home. It did not appear to be foaming at the mouth. We did not go back and get the dog as many people have wondered. First, how do you go get a dog. Second, how do you go get a dog in Quito, Ecuador. Third, screw that dog. I wasn’t going near it again. The cost for rabies treatment in the U.S. can be around $1000. In Ecuador we didn’t spend a dime. In Peru, we paid about $40 for one shot.